We happened to be in Taiwan during the Chinese New Year, and it seemed like a fitting place to celebrate. We’d never done a really honest to goodness celebration of the Asian holiday, so we made a point of doing something special. 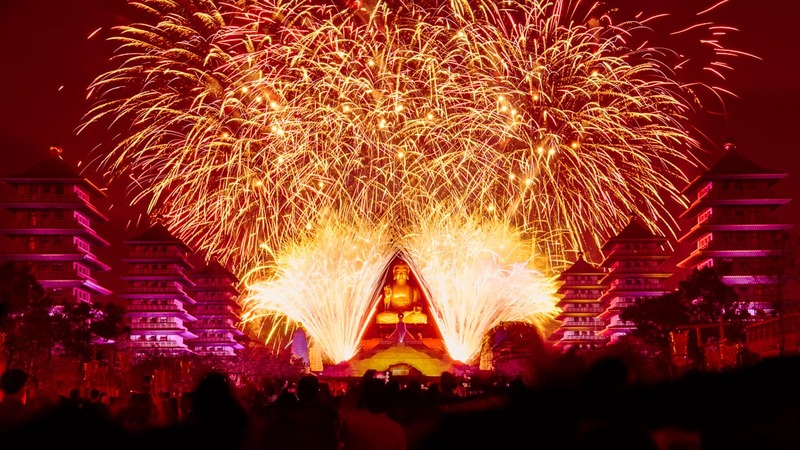 When we found out that Fo Guang Shan made a month long affair of it with fireworks every night, that sealed the deal on our four night stay at the famous Buddhist monastery. It was one of the most fun experiences of our time in Asia so far. 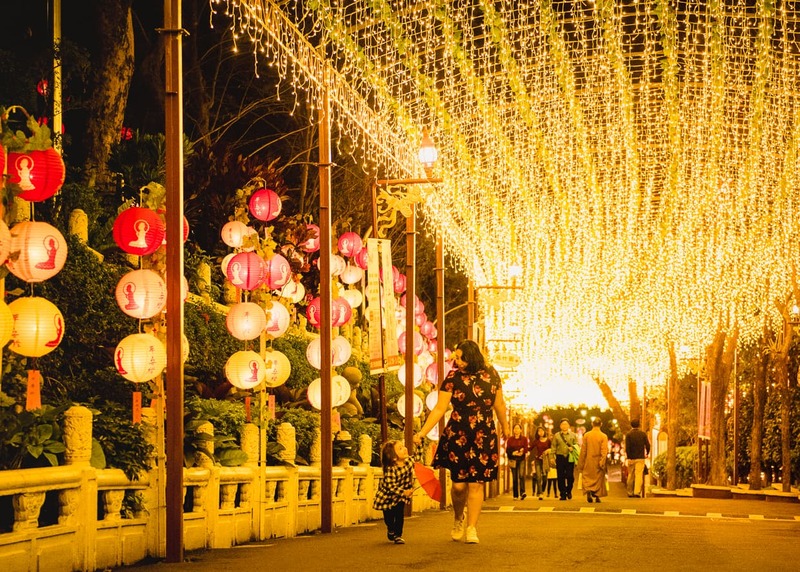 Chinese New Year Lanterns at Fo Guang Shan Monastery in Kaohsiung, Taiwan. 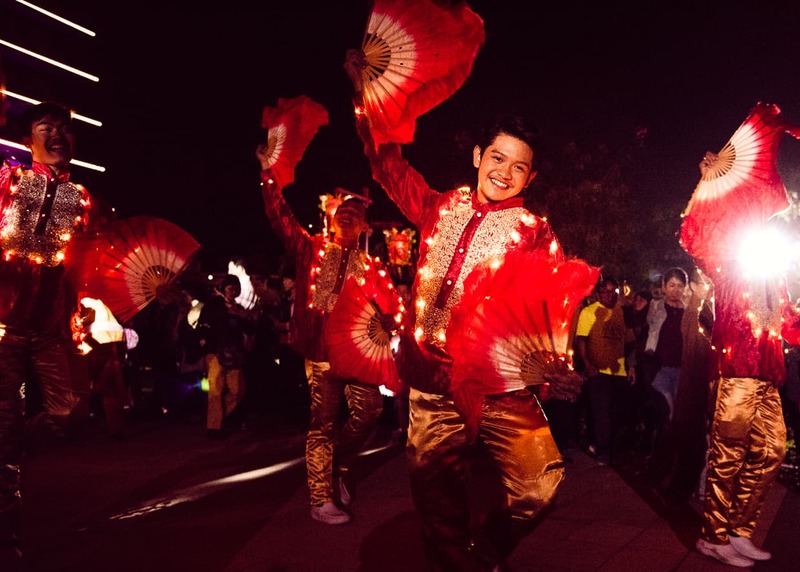 It turns out that the Chinese New Year celebrations in Fo Guang Shan outlast the already lengthy holiday, and continue for an entire month. 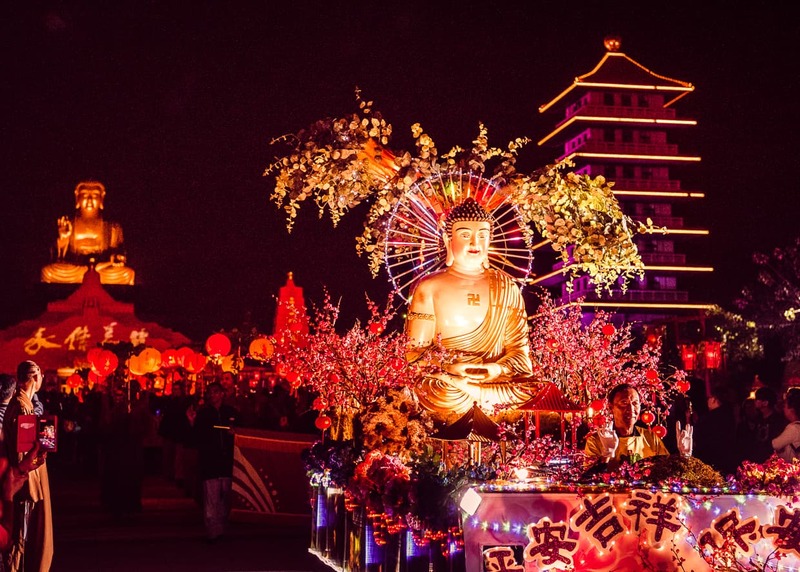 That means if you are in Kaohsiung, Taiwan (or really anywhere in Taiwan, it’s not a huge island), you can easily enjoy your New Year any way you like, and then go to the Buddhist Monastery to enjoy the spectacle there as well. 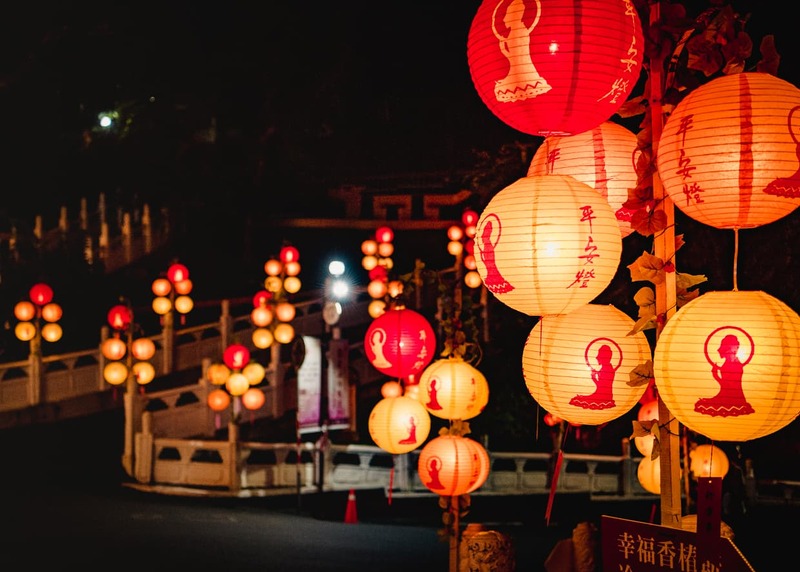 Unlike the Western New Year, which always falls on January 1st, the Chinese New Year jumps around a little bit because it is based on the lunar calendar. The first day of the Lunar year is on the new moon between January 21st and February 20th. 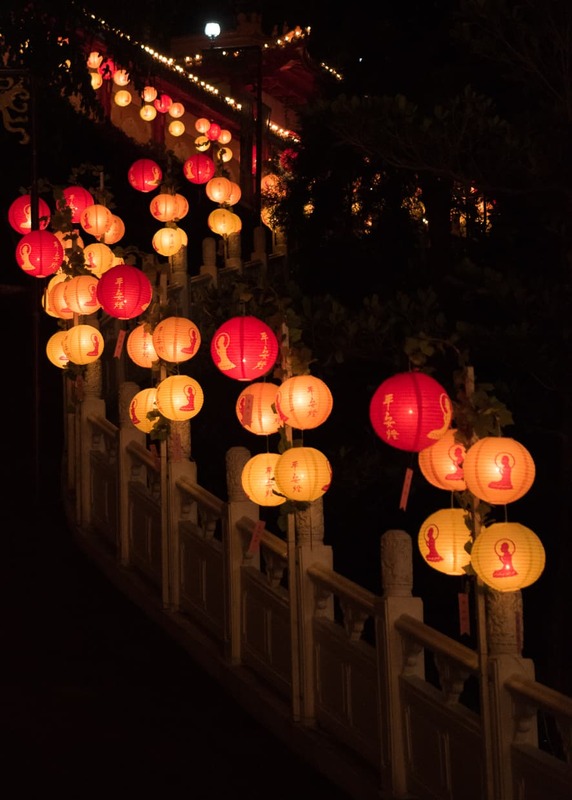 Though the date is harder to track than the Western New Year, the general idea is the same, it’s a time for celebrating new beginnings and wishing one another prosperity in the coming year. 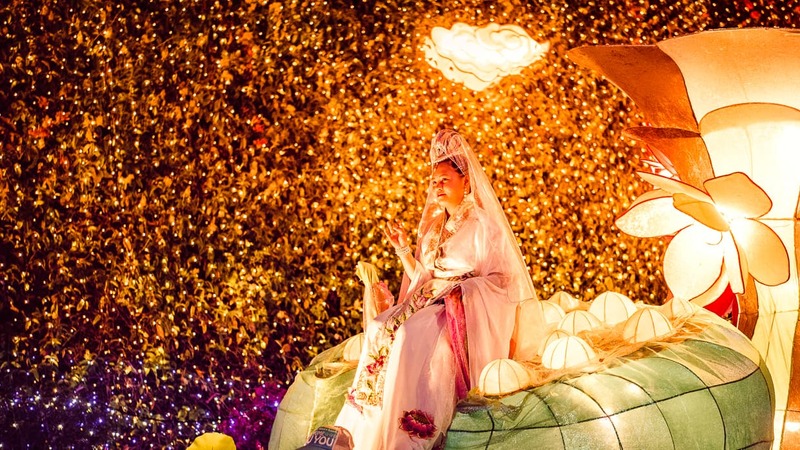 Its celebrated not just in Mainland China, but in Taiwan, other Asian countries, and anywhere in the world where the culture has a foothold. The celebrations themselves are quite different, however. 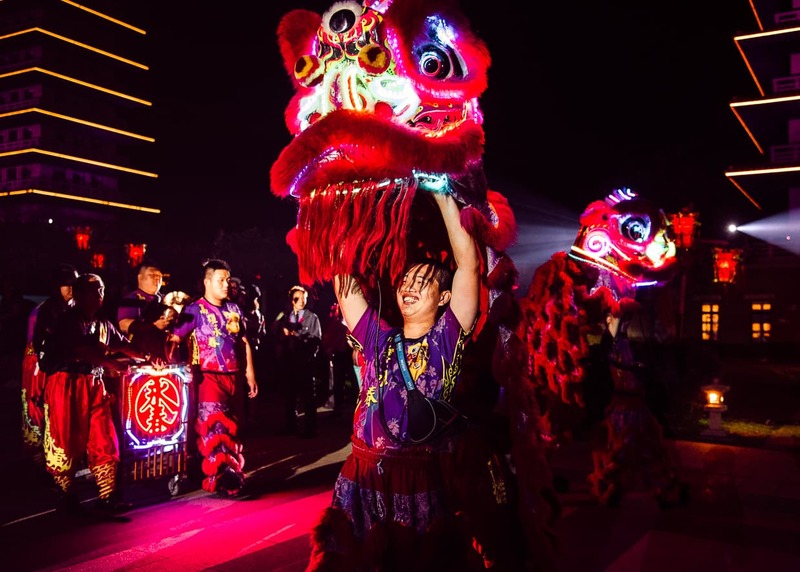 I’ve always thought of New Year’s Eve as a night of partying with friends (think countdowns, fireworks and champagne) but Chinese New Year is typically a family affair. It involves exchanging gifts, eating, and traveling great distances to be with one another. The celebrations last for two weeks, and as a result, travel in Asia can be a nightmare during this time period (we sure had a hard time finding lodging in Jiufen). Hotels fill up, roads get clogged, and airfare skyrockets. If you’d like more details on Chinese New Year customs (or customs for similar holidays in Asia) head over to the wikipedia page where they go into more detail than I can in this article. 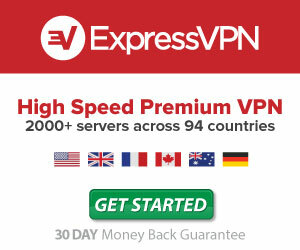 What and Where is Fo Guang Shan? Fo Guang Shan is an enormous Buddhist monastery and outreach complex on the outskirts of the Taiwanese city of Kaohsiung. It’s also the headquarters of the Fo Guang Shan Humanistic Buddhism movement. The Fo Guang Shan Complex is home to not just a monastery where monks and others practice, it also features a sprawling (yes, sprawling is the perfect word) Buddha museum, one of the largest Buddha statues in the world, many auditoriums for events and performances, restaurants ranging from a volunteer kitchen to fine dining, and scores of friendly volunteers who are welcoming to visitors. 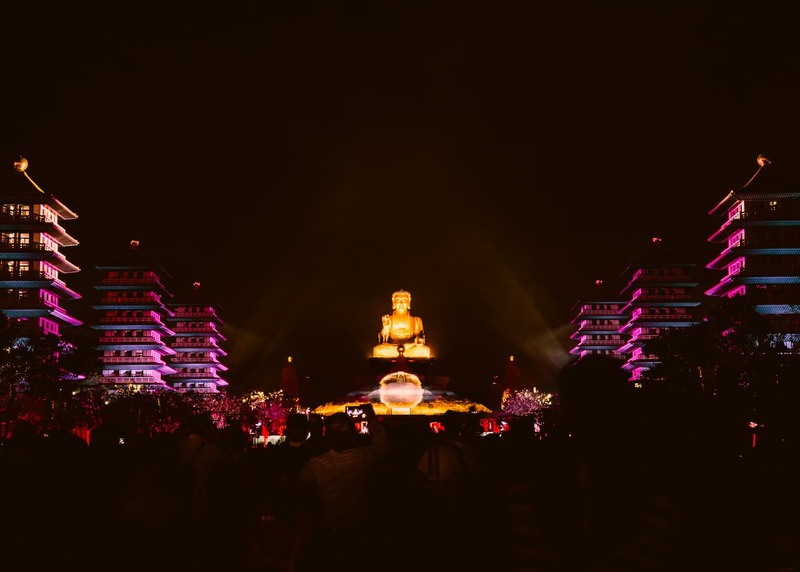 Fo Guang Shan’s Big Buddha Statue at night during the light show. 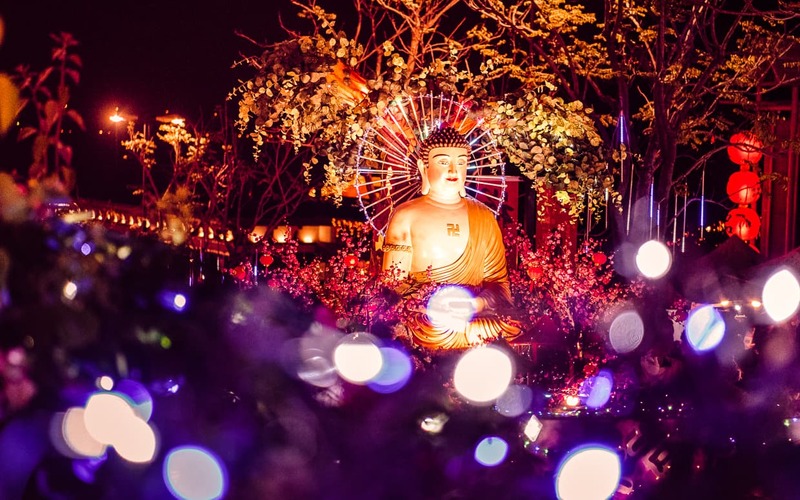 If you are interested in learning about Buddhism, exploring the culture of Taiwan, or just want to see some spectacular architecture and landscapes, Fo Guang Shan is a must visit if you are in the Kaohsiung area. 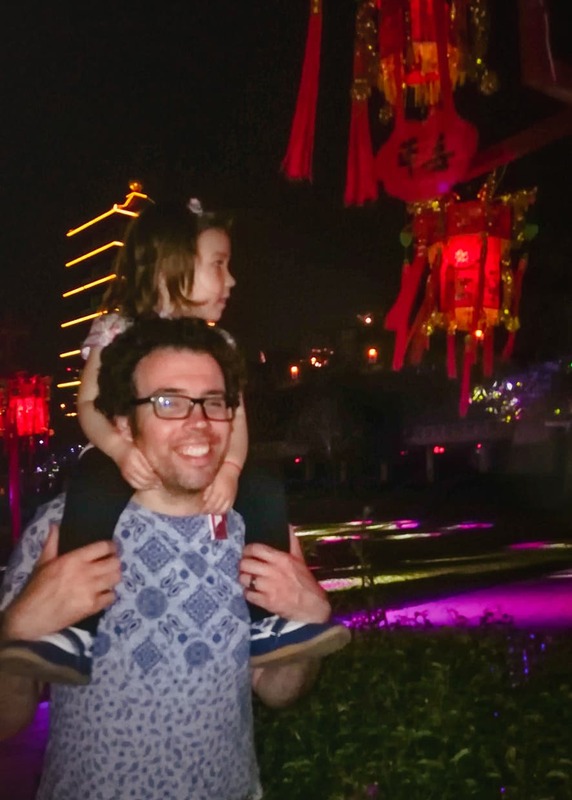 In our other article, Visiting Fo Guang Shan Monastery In Kaohsiung, Taiwan, I go into a lot more detail about how to get there and what to expect as I discuss our family’s experience spending four nights in one of the Monastery dormitories. That article also contains information on making your booking, but even though a stay there is a great experience, it could also easily be enjoyed as a daytrip from Kaohsiung. 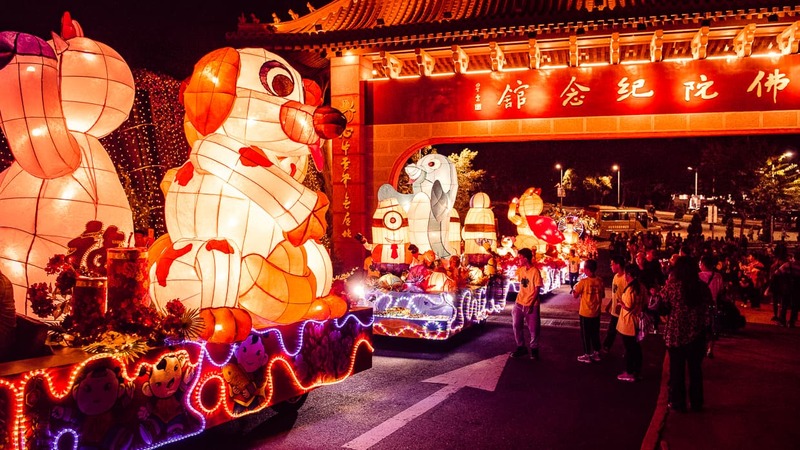 As I mentioned earlier, the Chinese New Year celebration in Fo Guang Shan lasted from February 16 to March 16 (in 2018 Check their website for current information). Other Buddhist sects have criticized the Fo Guang Shan movement for being more focused on their monuments and grand temples, I think that’s part of their charm. 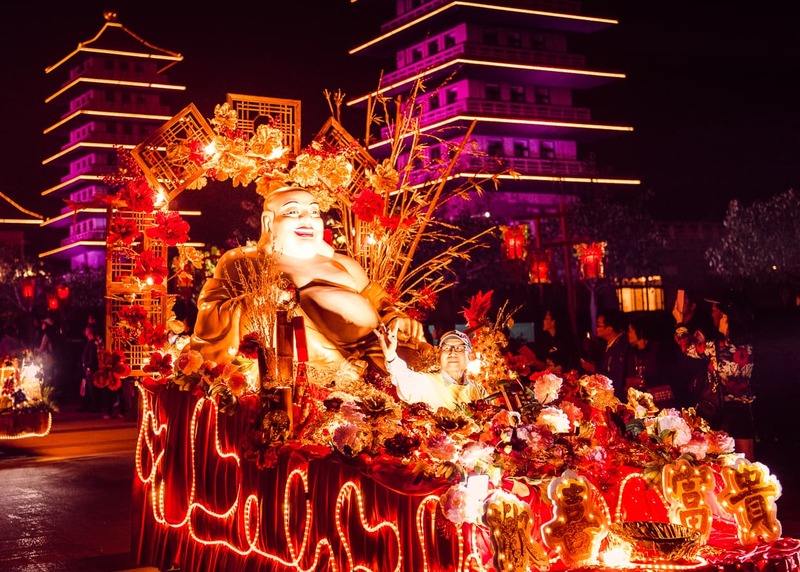 The Humanistic Buddhists are intent on spreading their message to a larger audience, and as a result, they aren’t afraid that a bit of spectacle will dilute the spirituality, so long people come by for a visit. This is a nice break from Buddhist temples we’ve visited in China where I’ve always felt like an outsider at best and an intruder at worst. 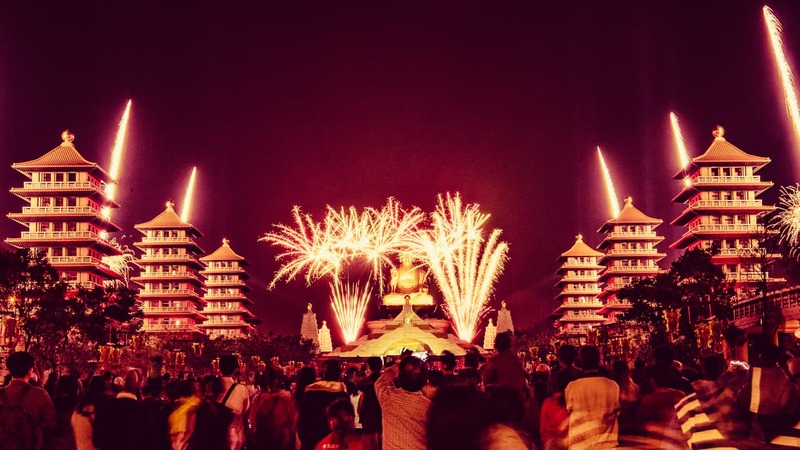 The extra long Chinese New Year at Fo Guang Shan is both a part of that outreach, and a chance for their Buddhist family to come together from all over the world. 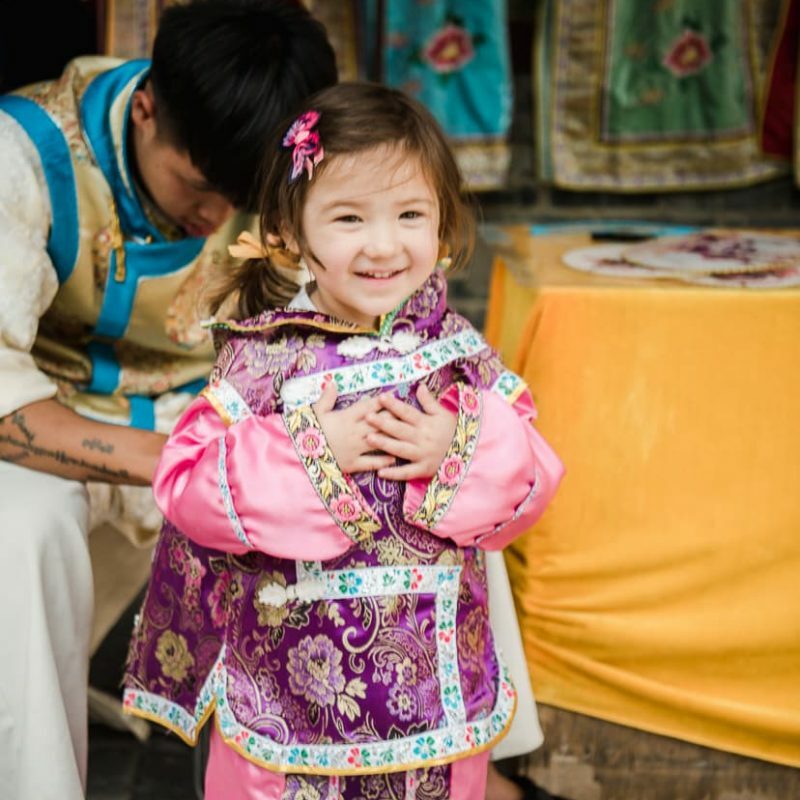 Much like grandchildren, cousins, uncles and aunts are gathering all over the world, Fo Guang Shan members from many countries are coming together in celebration at the huge mountain complex. One of the best parts of our experience there was meeting people from all over the planet who had come to celebrate together and make connections. We aren’t memebers of the Fo Guang Shan community, but we sure did get along with them while we were there. As I mentioned in our other article about visiting Fo Guang Shan, we took in an amazing Hebei acrobatics show (no photography allowed unfortunately) in the Great Enlightenment Auditorium inside the Buddha Museum. 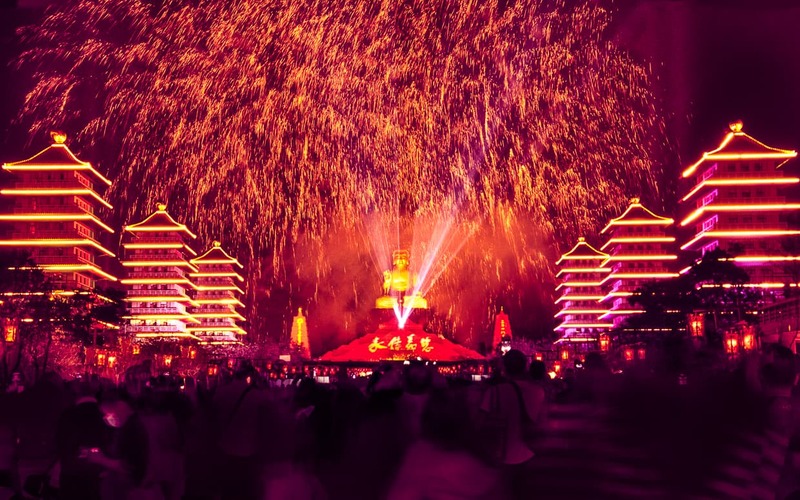 It was one of the best shows we’ve seen anywhere, featuring some amazing feats of strength, agility and cooperation, but it still wasn’t the highlight of our Chinese New Year at Fo Guang Shan. Our favorite performance had a much more personal touch. As I mentioned, Fo Guang Shan groups from all over the world were gathering at the temple complex in Kaohsiung, Taiwan. Many of those pilgrims were staying in the same dormitory as us. 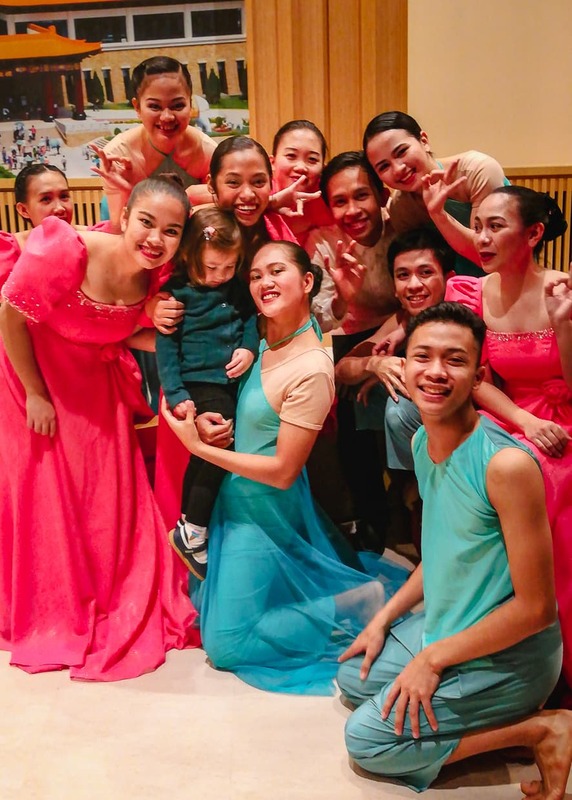 Included among them was a dance troupe from the Philippines. They were about the nicest people we had ever met, and Lisa fell head over heals in love with them. By about a day into our stay we were calling them Lisa’s boyfriends and girlfriends. Dancers from the Philippines who befriended Lisa. 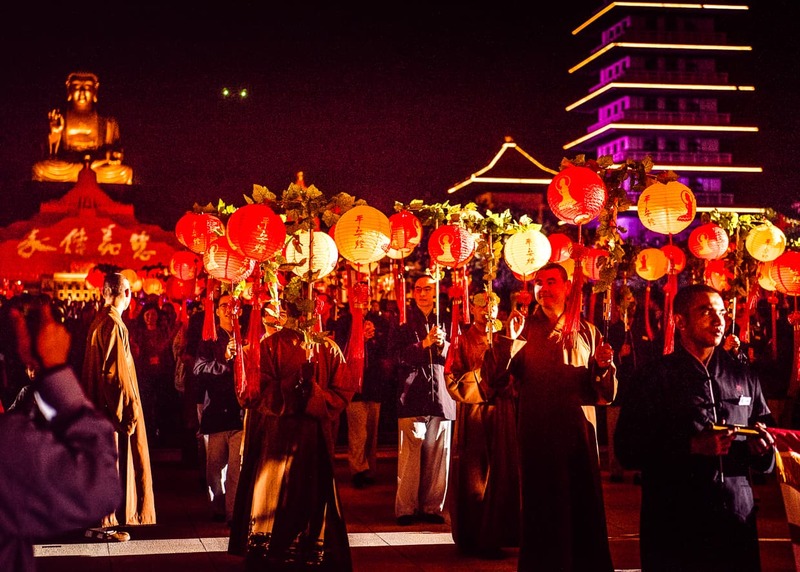 A performance in the Fo Guang Shan Buddha Museum during the Chinese New Year Celebration. The highlight of Lisa’s trip was when we went to see their performance, and got there early for a front row seat. Before the show started, we could hear one of them back stage tell the others that “Lisa is here,” followed by a bunch of them yelling “Hi Lisa!” She just squealed with joy. Their performance was also a pleasure, and since it was the year of the dog, Lisa also enjoyed seeing her boyfriends and girlfriends in dog costumes. There were many, many other performances available, but we couldn’t make it to all of them. If you’ve ever traveled to Asia, you know that dining is all about street food. But if you area vegetarian, this can be a little bit frustrating. 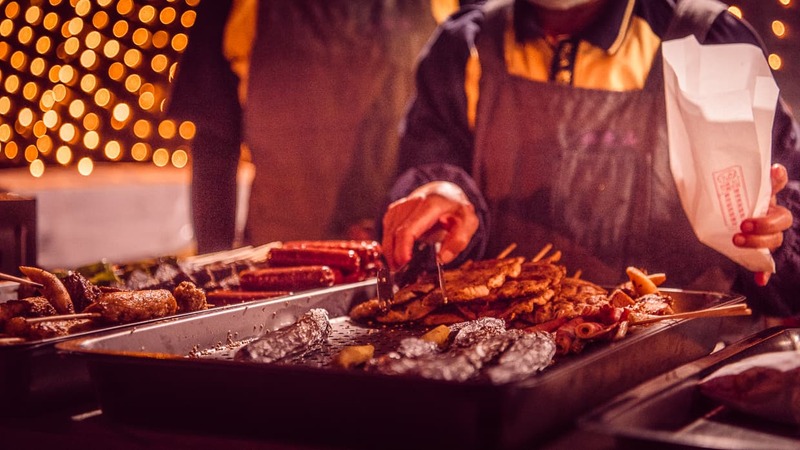 In the popular night markets and tourist streets, you can walk by food stall after tempting food stall without seeing anything that you can eat. Everything smells so good (except stinky tofu), but you often have to limit yourself to dishes that most travelers wouldn’t consider very interesting. People buying vegetarian street food. 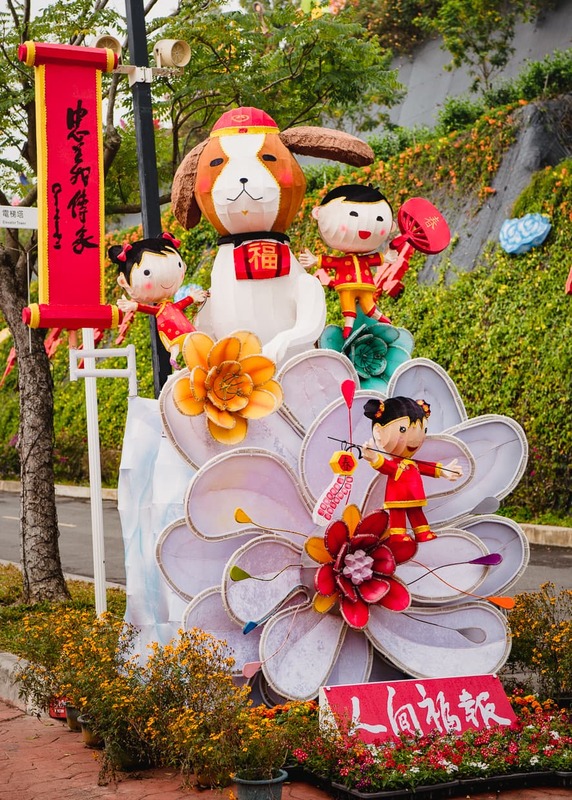 But during the Chinese New Year, the entire street leading uphill from the Buddha Museum at Fo Guang Shan to the monastery was lined with vegan food stalls. If you are not a vegetarian or a vegan, you can’t possibly understand what how special that is. Even though Taiwan is known for its vegetarian culture, the simple fact that you can just buy and eat whatever you want without have to search or ask questions, makes eating so much more enjoyable. Basically anything one would buy in a normal food market – meat skewers, soups, noodles, even sushi – was available in meat alternative format. Dannie and I overate every single day. 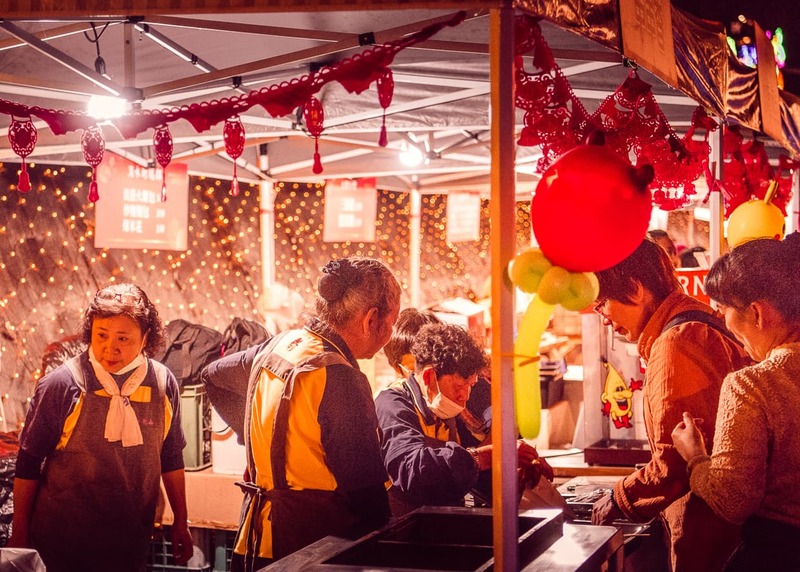 As I mentioned in our longer post about Fo Guang Shan, these food stalls are in addition to the other high quality vegetarian restaurants that are always available in the Buddha Museum and around the temple. 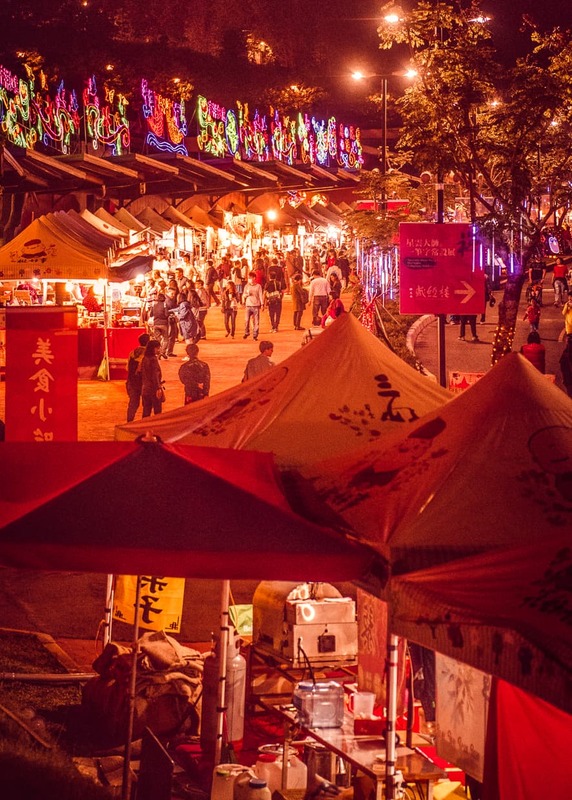 The Fo Guang Shan food street during the Chinese New Year. It’s all Vegetarian, and it’s amazing! One thing we’ve noticed since we started traveling in Asia, is that the real action always starts after dark. 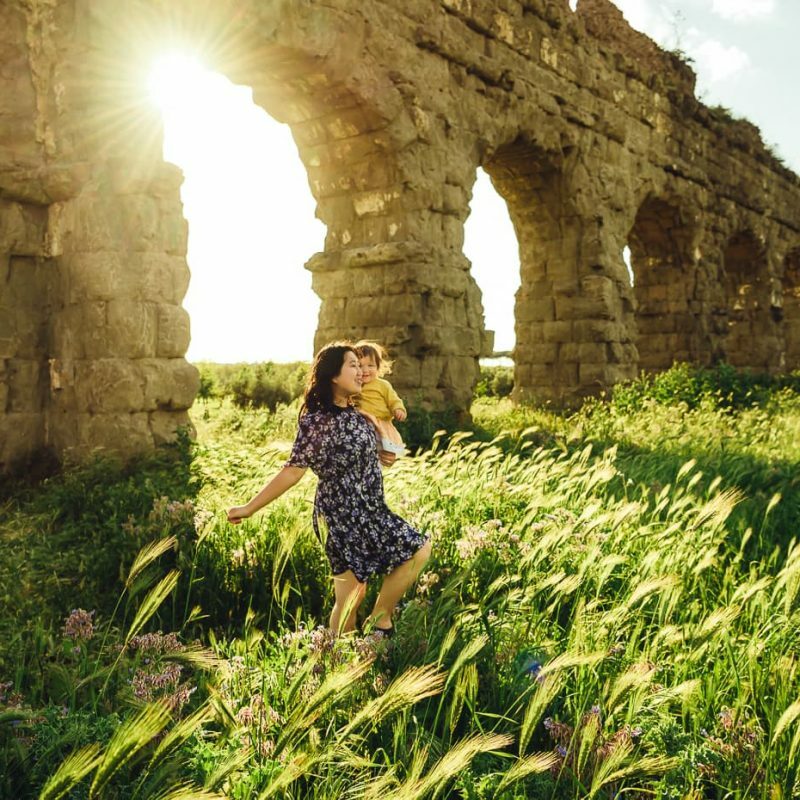 This presents a little challenge since we are traveling with a toddler, but sometimes you just have to go out and let her be tired the next day. 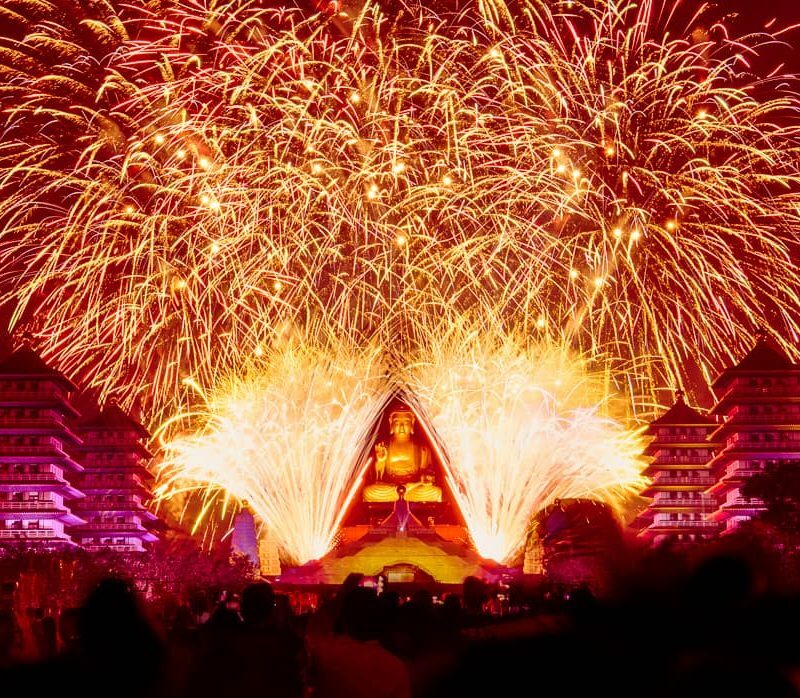 We figured fireworks over the Big Buddha statue were just such an occasion. Luckily, we had ample opportunity to enjoy the fireworks because there was a display every single night! There are a couple good vantage points for the fireworks. The obvious location is right down in the main courtyard of the Buddha museum on the walkway that runs between the Pagodas. The advantage of this location is that the show is designed for that angle. It’s not just fireworks, it’s also a 3D light show and dance performance. This is the angle from which I took our photos. Fo Guang Shan fireworks. Happy Chinese New Year! Another location is from the Community Garden or the Sutra Repository (Google Maps) just up the hill from the main entrance. The upside of this location is that you are elevated and your view won’t be blocked by anyone’s head. The downside is that there is limited space. Also because of the way the light show works, a lot of it is just plain invisible from this direction (I don’t understand why). You can see the fireworks very clearly, though. 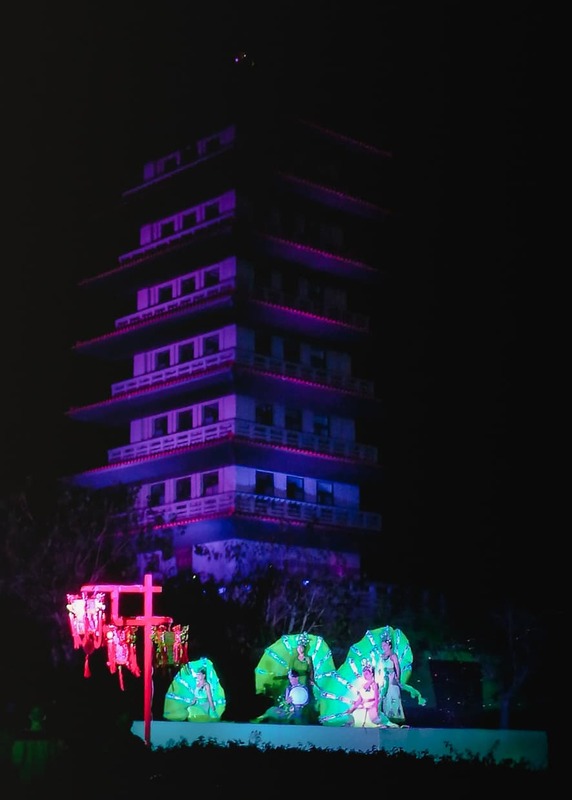 The Chinese New Year light show on the pagodas in the Fo Guang Shan Buddha Museum. 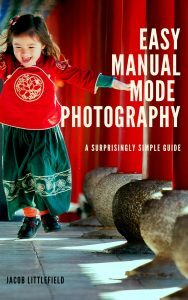 By the way, if you are planning on photographing fireworks but you aren’t confident with your camera, a great way to get started in mastering your craft would be to read my new e-book, Easy Manual Mode Photography. With using manual mode, fireworks photography is going to be pretty much entirely up to luck. After the fireworks show every night, there was a parade that started right at the top of the Buddha museum, made its way through the courtyard, right through the main hall of the museum, and then out into the street and up the hill toward the temple and the Monastery. If you watch the fireworks from the courtyard, you not only get to watch it from a foot or so away, you also get to walk right along with it. By the time it got to the main entrance, the crowd was mixed right in and it was a blast. 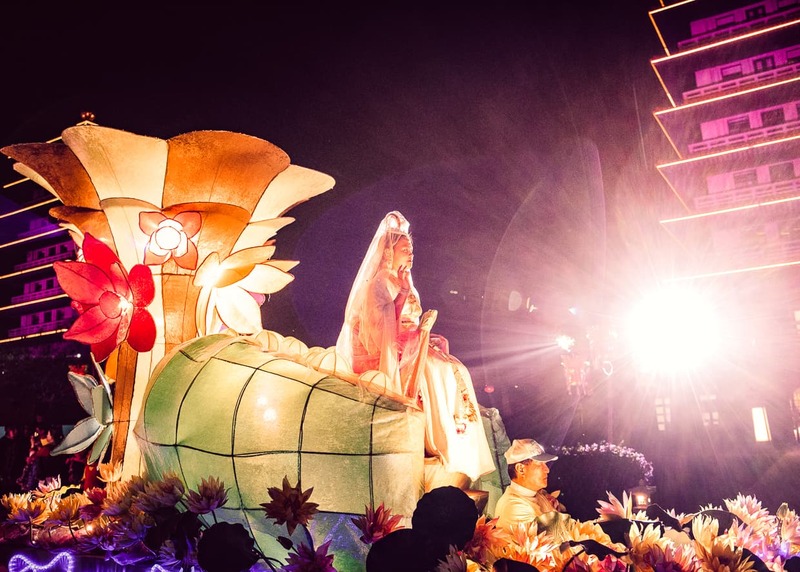 If you are watching the fireworks from outside the museum, you can still catch up with the parade right at the main entrance, and then walk with it up the food street, where the vendors are still open. I’m not normally a parade kind of guy – mostly because my main experience with parades from the States consisted of being stuck in traffic while waiting for them to end – but this one was freewheeling and fun. The bystanders all seemed like they were a small part of the performance, and the fact that our friends from the Philippine dance troupe were marching certainly helped. After the parade was over, we went to the skewer stall and bought up their entire remaining supply, which we ate while Lisa played in one of the gardens. It was way past Lisa’s bedtime, but she was having enough fun looking at the parade floats that she didn’t get cranky (much). The Chinese New Year Parade makes its way up the Fo Guang Shan Food Street. 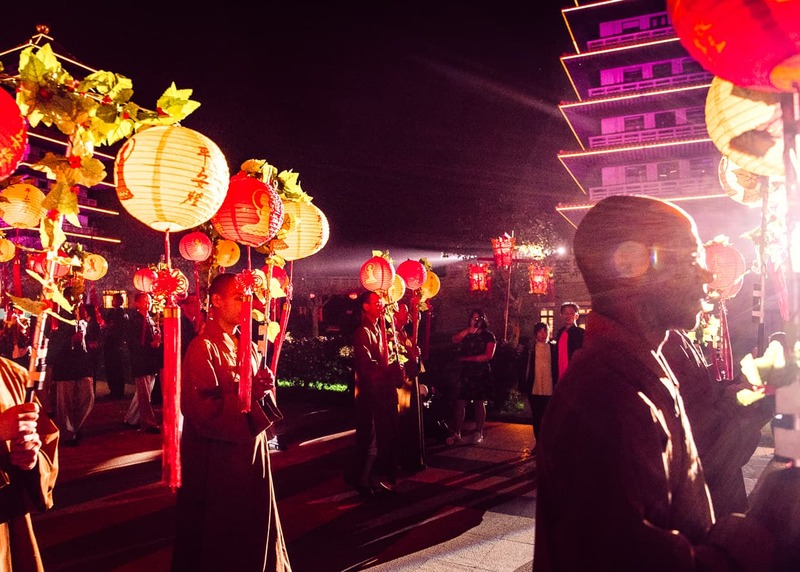 Fo Guang Shan was the best New Years party we’ve ever been to. While we were in Hong Kong, earlier in the year, we rang in the Western New Year, watching the fireworks from our hotel room. It was fun, and the view of Victoria Harbour was great, but we just didn’t feel like a part of the scene. The best part was that the entire experience was completely family friendly and safe, with no fear of drunk drivers, firecracker accidents or any other hazards that we associate with the New Year. 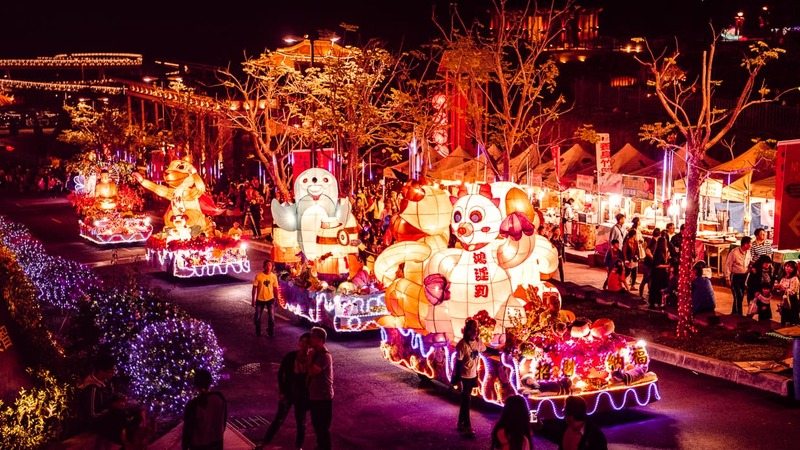 And Chinese New Year at Fo Guang Shan lasts long enough that you can enjoy it even if you’ve already enjoyed it somewhere else. 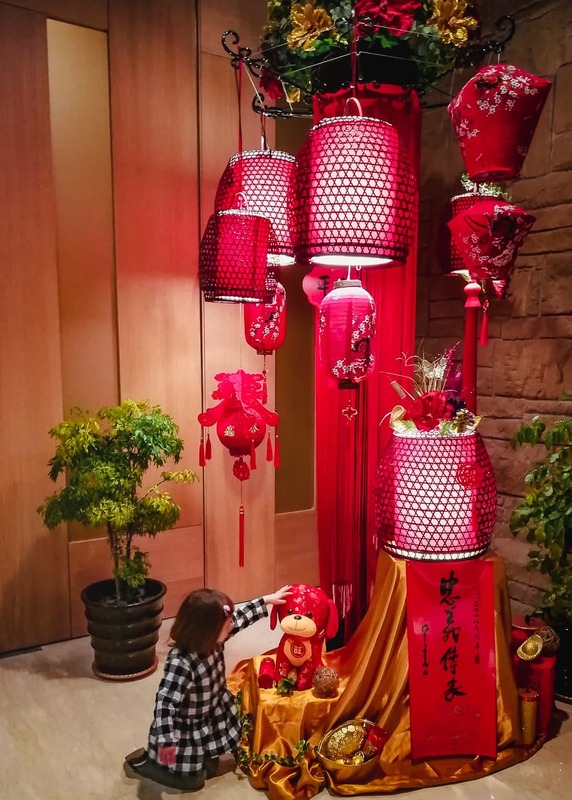 If you are thinking about going to Fo Guang Shan for Chinese New Year, don’t forget to read about our stay at the monastery for tips on getting there, making reservations and enjoying your visit, whether it’s for an afternoon or a week. You might also want to read the rest of our content about Taiwan, or the many other destinations we’ve written about in Asia and other parts of the world. 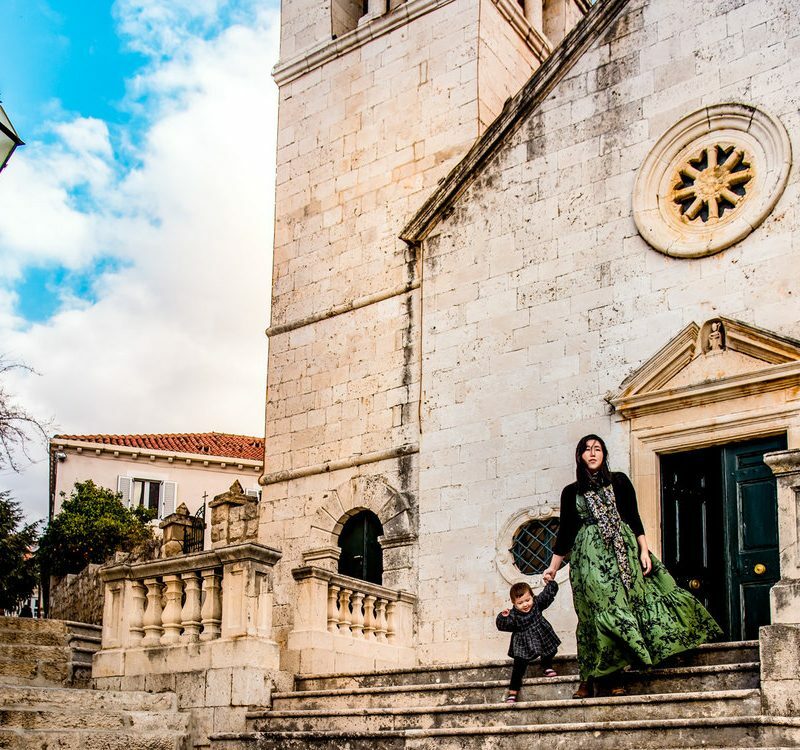 You can help support us as we travel and create articles like this one by visiting our resource page our our shop the next time you are planning a trip, or by simply browsing our blog and commenting on posts (like this one!) to ask questions, contribute your experiences, or even just to let us know you found it helpful. We always love to hear from you. Thanks so much for reading, and happy travels.